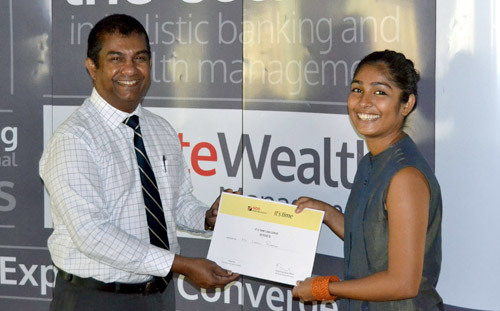 Fashion designer Lonali Rodrigo, of House of Lonali fame was selected as the first of three winners for the inaugural NDB Wealth “It's Time” Challenge, where her vision for the future of her sustainable fashion brand earned her a NDB Wealth account worth Rs. 50,000. Commenting on this exemplary young individual's plan for success, NDB Wealth CEO, Prabodha Samarasekera said, “We are pleased to offer Rs. 50,000 NDB Wealth account for investments to Rodrigo to grow the footprint of her fledgling fashion brand, which I am sure will also positively impact the Sri Lankan fashion industry and the craft communities. As a precursor to the launch of an all-new range of innovative, NDB Wealth lifestyle plans, “It's Time” Challenge offers entrants the opportunity to win a Rs. 50,000-value NDB Wealth account weekly. Further, it also provides participants a catalyst to kick start their potential. So, take advantage of this once-in-a-life time opportunity over the next few days by visiting www.itstime.lk, and telling us about your dreams, goals and plans. Interestingly, of the numerous entries already received for the first-of-its-kind NDB Wealth “It's Time’ Challenge, most have been from young people in their mid-twenties who have indicated that they want to take the first step towards turning a big dream into reality, or even just buying their own dream home or having the perfect vacation.